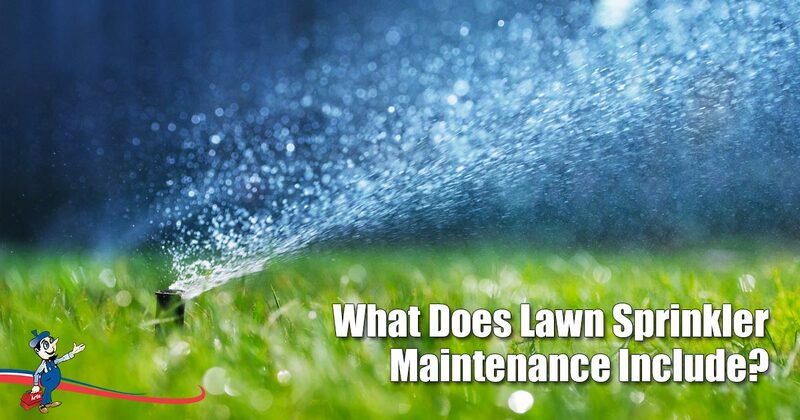 Home » Plumbing, AC & Electric Tips » Irrigation Systems » What Does Lawn Sprinkler Maintenance Include? What Does Lawn Sprinkler Maintenance Include? A sprinkler system is made up of several different mechanisms working together to provide optimum ease when it comes to your lawn. Trying to fix or maintain it on your own, may increase the price of the repairs. When it comes to lawn sprinkler maintenance, calling a professional like Art Plumbing, AC & Electric is recommended to keep your yard green and frustration free. Unlike watering a yard yourself, where everything gets wet, sprinkler systems direct water straight to the root of the plants. Preventing weeds from being watered and growing, these systems also reduce the potential for leaf disease. This disease is caused by water droplets that are left standing on the leaves of plants over time. Sprinkler systems can be used to save you both time and money. Time taken away from family by watering the lawn, is saved through timers on the sprinkler systems. They can be set to turn on for a specific time daily, or weekly, and shut off automatically when the cycle is complete. An effective system should reduce your water bill by using less water, more effectively. The water out of a hose comes in significantly larger droplets than that out of a sprinkler. These large droplets can cause the soil to become compact, suffocating the plants and causing them to die. It also carries the risk of nutrients escaping with the excess water, leaving the plants malnourished. Sprinkler systems use smaller droplets, eliminating these risks. Maintaining an irrigation system is one of the easiest ways to improve plant health and reduce wasted water. Ideally maintenance should be done once a month, but twice seasonally minimum. The maintenance process involves checking to see that all the different components are in working order and still in good order. After the timer is plugged in and is working, the following should be checked and updated. Unless you are familiar with irrigation systems, it is always recommended that a professional be called when uncertainties arise. Although it is possible to perform maintenance on your own lawn sprinkler system, there are a few benefits to hiring a company like Art Plumbing, AC & Electric to do it for you. We know what we are talking about – we know what to look out for and what to be careful of. A sprinkler system is not simply a garden hose in the ground, it has electric parts, valves controlling different pipes and a backflow preventer. Not knowing what you are doing could lead to further, more expensive repairs. You are able to rest easy knowing that your sprinkler system has been checked, and cleared, by professionals who are good at what they do. Maintenance that should be quick and easy, could take twice as long, leaving you frustrated and irritable. Hiring a professional to do the job for you, may cost a little extra, but will save you the grey hairs. Lawn sprinkler systems look after your garden without you having to do a thing. Why waste time doing maintenance checks, when you are probably unsure what exactly you are supposed to be looking for? Call Art Plumbing, AC & Electric to maintain and fix your lawn sprinkler system with ease and speed.